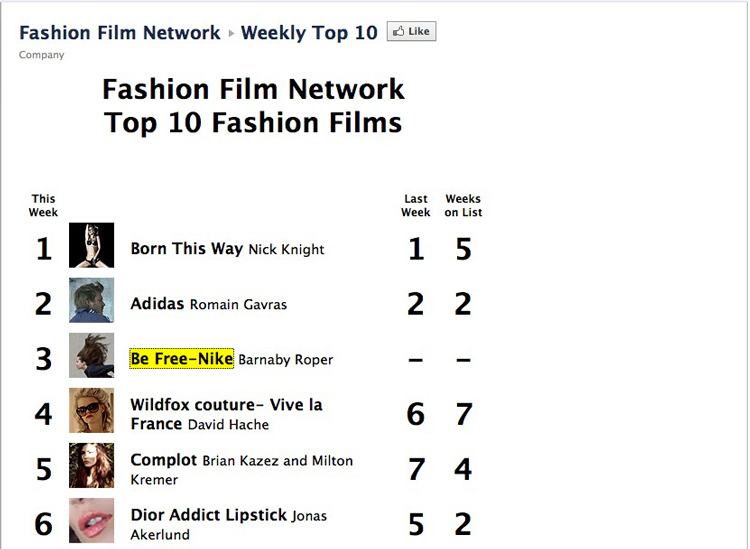 nike: be free film by barnaby roper for ceft and company makes the cut on the “fashion film network” top 10 list of fashion films, losing the number 1 spot to lady gaga’s “born this way” video filmed by nick knight. the adidas’ 2nd place was surely a spoiler for us, but its interesting to note the romain gavras’ spot was created with a budget 32 times the funding of nike’s be free, mainly because the “be free” film was an add on to the print campaign in the final hours of production, this was thanks to the nike’s trust and foresight in taking the agencies recommendation on including this film in the production plan. *ranking was based on number of views interpreted through combined weighted metric of selected web sources and data feeds. you can see the behind the scene footage of the film here, and the footage of the print shoot with french art photographer denis darzacq here. view all work related to this project.